If you are intrigued by eerie apparitions and things that go bump in the night, consider staying at one of a countless number of bed-and-breakfasts across the U.S.A. known for ghostly happenings. Many of these B&Bs are in historic homes, some of which have friendly spirits still lingering from the past. Get a list of truly spooky places to room for Halloween or anytime at BedandBreakfast.com and book your stay today! Below is sampling of haunted inns available. At this B&B, guests stay in one of the nine former railroad cabooses. A number of guests have told the innkeepers that they have seen a man in striped pajamas at night either walking around the Celebrations caboose room or sitting on the bed. Due to visits from this ghost, a few guests have actually asked to move their rooms. The Celebrations caboose is renamed the Haunted CaBOOse for the month of October and is decorated for Halloween. 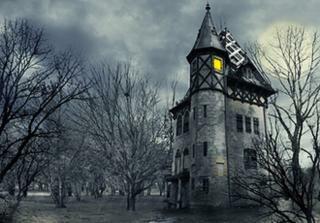 The innkeepers think the ghost may be the spirit of a former railroad worker. BedandBreakfast.com up to 8% Rebate Get up to $200 of Free B&B Gift Cards - Give the Gift of Travel! Expedia up to 6% Rebate Treat yourself to a last-minute getaway! Choose from great hotel deals in your favorite cities only at Expedia.com! LuggageGuy.com up to 13% Rebate Warm Up With an Extra 30% Off Use this Code. In the early 1900s, a young woman clad in a wedding dress waited for her groom to arrive for their wedding at this inn. He did not appear, and despite a search, he was deemed to have disappeared. The woman vowed to reside at the inn until he came and stayed on staff for the next 20 years until her death in the late 1920s. In 1930, a man arrived by horseback in search of a woman, and when he climbed the stairs to find her, innkeepers reported seeing the woman waiting in her wedding dress. The couple embraced, then disappeared. No one ever came to claim his horse. Since then, there have been numerous sightings of a woman in her wedding dress. Featured in the book Haunted Hoosier Trails, guests have reported seeing a little girl ghost, often observed late at night on the master staircase. She has been noted to "mess with the guests' stuff" or turn on the fireplace in their rooms. The Indiana Ghost Trackers investigated the inn and reported that Sarah Ritter, an original inhabitant, and her two children died in the home. The Ghost Trackers detected the presence of a young girl and a male. A door repeatedly opened behind them when the girl's presence was felt during the Ghost Trackers' stay. Not only is this 130-year-old National Historic Register B&B certifiably haunted, guests can explore another dimension during October Teen and Parent Ghost Hunting Weekends. Enjoy a ghost tour and seminar and learn hands-on skills for ghost tracking, plus how to record orbs and vortexes in audio, video, photographic and temperature formats. Several psychics have visited the inn and said an “energy vortex” is present. People hear voices; the head chef hears a man greet her many days with a "Good morning!" Once, a salad plate spun around and shot across a table and broke, and utensils and furniture have been reported as moving right before employees’ eyes. A former innkeeper reported his dresser was moved in front of the door while he slept and all the clothes were taken out and strewn about the room. In the morning, he accused an employee of sneaking into his room and doing this! Late one night, two employees heard something pounding on the inside door of the locked walk in-cooler. Of course, it was empty when they looked inside. Visitors to this historic 1754 inn are told when they arrive that if they hear the loud knock at the door, they can answer if they like, but nobody will be there. Those who stay at the Adelaide Room are sure to have some contact with the mysterious woman and her two children who once lived there, whether it is through the TV turning on and off or the shower curtain continuously falling down. One guest even had her ChapStick levitate out of her purse on a recent visit.